Democratic Republic of Congo self-exiled opposition leader Moise Katumbi has addressed thousands of supporters during a rally on Saturday. The businessman and former governor of the copper-producing Katanga Province has used a video link on Saturday to speak to his supporters ahead of December election that he hopes will end the reign of President Joseph Kabila. 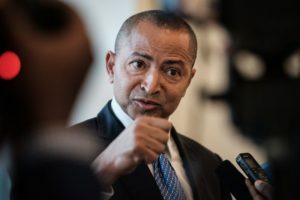 Katumbi who has been in exile since May 2016, when prosecutors accused him of hiring foreign mercenaries, vowed to return home to enter the presidential race. The multi-millionaire, owner of Congolese football club TP Mazembe Katumbi, who has since traveled to South Africa, Britain and France, has denied all the charges, saying they are politically motivated. Before fleeing his country, Katumbi was considered the front-runner in the race to succeed Kabila as president. Failure to hold the election in December could embolden militia groups, whose attacks have forced thousands to flee their homes, deepening a humanitarian crisis. Joseph Kabila earlier this year said he will not contest in the coming elections. According to information minister Lambert Mende, Kabila intends to respect the constitution of the country and to hand over power after the December 2018 elections. Kabila came to power in 2001 after the assassination of his father Laurent Kabila. He has since won the last two elections organized in the resource—rich country, first in 2006 before his re-election for a final term in 2011. Posted by Geraldine Boechat on June 11, 2018. Filed under News. You can follow any responses to this entry through the RSS 2.0. Both comments and pings are currently closed.